Another terrific day walk in Tassie, this time taking in the summit of Mt Rufus in the Cradle Mountain-Lake St. Clair National Park. The walk commences from the National Park Visitor Centre, seven or so kilometres along a sealed road from a turn-off at the Lyell Hwy. The visitor centre sits at the southern end of Lake St. Clair and is a popular and busy spot with camping, cabins, a visitor centre and a licensed cafe. The walks in this part of the park all start by following a closed (except to management vehicles) vehicular track that proceeds west from the visitor centre. After about half a kilometre a signposted track to Mt Rufus is reached. This track climbs steadily west for about four kilometres to a junction. Ignoring the link track, the path proceeds to climb west, before turning south-west and the north-west to work around a prominent rocky outcrop. There’s a final steepish pull up to the ridge line and then a fairly leisurely stroll up to the prominent summit cairn. Views from the summit are simply magnificent with Lake St. Clair to the east, the Franklin-Gordon Wild Rivers National Park to the west and to the north, Cradle Mountain and the wilderness traversed by the Overland track. From the summit you could return the same way, but if time permits a better option is to descend north-west to a saddle and then eastwards towards Shadow Lake, before following the path through forest, an impressive clearing that requires careful attention to staying on the track as this area is rather boggy, and some wonderful woodland that includes one of Australia’s few native deciduous trees, the deciduous beech (or Fagus)*. I was there in autumn, so the leaves had started to change colour and this part of the walk was particularly attractive. The path eventually arrives at Watersmeet where it’s a 1.5km walk back along the vehicular track to the visitor centre. All-in-all a definite A+ must do Tasmanian walk. * I thought this was Australia’s only native deciduous tree, but a bit of research revealed that there are several others, although all are monsoonal deciduous (i.e. they lose their leaves just before the wet season) – the beech is the only native winter deciduous. This page has more information. This is another great day walk that is easily accessed from the lovely city of Hobart. It provides for excellent alpine walking with extensive views and secluded and attractive lakes and tarns. The walk commences from a car park at the end of the gravel road that leaves the C632 road (see access below). 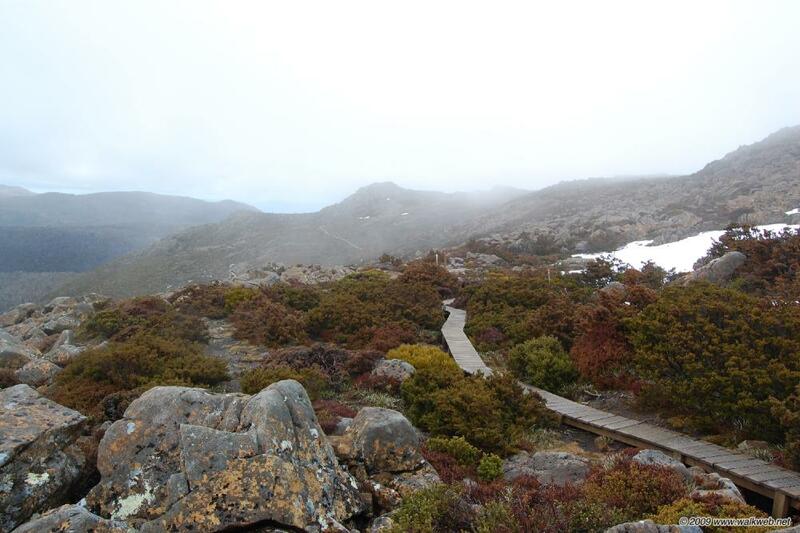 There is a large visitors shelter and the path to Hartz peak is clearly signposted. Follow the path, which is boardwalks for a good deal of the way, as it climbs slightly and passes a signposted track to Lake Esperance (worth a side-trip). The path reaches Ladies Tarn another 1km or so further on at which point the track becomes less well used but still easy to follow, turning westwards for a short but very steep climb up to Hartz Pass. From here the path turns south climbing steadily, marked by regular signposts with orange arrows and a series of small cairns. A bit of rock scrambling is required to attain the summit. The summit has a trig point and there is a small wind shelter nearby. The walk returns by the same route. The day I was there in May the weather was pretty terrible on the way up to the summit – no views but plenty of wind and rain, which pretty much describes the weather when I did the walk in May 2008. Nonetheless, it was still enjoyable – or perhaps invigorating is the best word. Highly recommended, but please be ready and equipped for poor weather. There were a few Japanese tourists walking ahead of me in jeans and casual jackets – thankfully they only went as far as Lake Esperance as they were completely un-equipped for the conditions. Access: Follow the A6 from Hobart to Geeveston. From here take the road signposted ‘Hartz Mountains National Park’ and keep an eye out for further signposts. Eventually a gravel road is reached (just after Arve River Picnic Area) which leads to the car-park and start of the walk. Mt Wellington provides an impressive backdrop to the city of Hobart, and also provides for some excellent walking in an alpine environment and tremendous views. Although you can drive right to the top, walking up at least part of the way is more enjoyable and provides a better introduction to the mountain. This circular walk commences from ‘The Springs’, located on the main road to the summit. It takes in the summit as well as a walk across the plateau. Because this is an alpine area, you should be well equipped for poor weather. The walk commences from either the main car park at The Springs, or from the minor road that leaves the main road to the left and climbs briefly. The first part of the walk is the Pinnacle Track which is well signposted and easy to follow. After a series of steps the path becomes a well trodden bush track that climbs steadily to the north with occasional views to the east. After about 1.5kms a junction is reached; turn left up the accurately named Zig-Zag track which soon starts to climb steeply and provides superb views if the weather allows. The track eventually reaches the plateau and a track junction, ignore the track to the left for the moment (this is the path for the return journey) and instead stay on the well formed track as it passes to the left of the transmission tower on its way to the summit which is in the middle of a road loop so take care to watch out for traffic. After visiting the summit you could also drop down to the visitor centre or take in a viewpoint just to the west of the summit. In fine weather, the views are superb and extensive. The return journey follows the path back to the above mentioned track junction and then follows a much rougher track, marked at regular intervals with poles fitted with orange markers. This track, the South Wellington Track, traverses the summit plateau before dropping briefly but steeply into bushland and ultimately reaching a signposted track junction with the Ice House Track. Take the Icehouse Track which is generally easy to follow as it descends through forest and eventually reaches the Miles Track. Turn left here back to the carpark. Overall, a terrific walk featuring great views and a varied and interesting alpine and sub-alpine landscape, and all less then 30 minutes out of Hobart, a beautiful city in itself. Another great walk in Mt Field National Park, which is an hour or so west of Hobart. This is a fairly demanding one with some strenuous climbs and rock scrambling and is recommended for more experienced walkers. An out-and-back walk, the target is Mt Field West – the highest point in the park – and it took me a little under seven hours. The walk commences at the Lake Dobson car park and initially follows a boardwalk and path by the side of Lake Dobson before branching off and climbing to a vehicular track that also climbs steeply to some ski huts. From here the walk proper begins along a well defined path and boardwalks, with great views of the Tarn Shelf and Lake Seal to the north. Eventually the track reaches a junction. Take the uphill path signposted to Mt Field West. This track soon leads to a large field of boulders and the next part requires traversing this by following the occasional track marker and red painted marks on the rocks themselves. The way climbs upwards towards the ridge line (the Rodway Range) and once reached becomes a visible path again before descending another rock field down to K. Col.
From K.Col it’s a short walk to Peterson Memorial Hut, which makes for a nice rest spot. From here the path continues to climb, passing Clemes Tarn and looking towards the impressive Naturalist Peak which is passed to the left. From here the path traverses a somewhat boggy plateau (which looks like it would be fairly hard going in wet weather) before a final rock scramble to the summit of Mt Field West from where there are excellent views. From here it’s the same way back – take care when climbing up from K. Col to the Rodway Range to carefully follow the marked trail so you end up in the right place to pick up the track down the other side. Notes: There is no marked trail to Naturalist Peak but it’s worth a short side trip, I found leaving the main trail to the south-west of the summit provided reasonably easy access. The summit itself is clearly marked with a trig point. I wouldn’t recommend this walk in mist or bad weather, you won’t get any views and route finding, particularly over the boulder fields, would be difficult. A fantastic circuit walk in the Mt Field National Park, an hour or so west of Hobart. The walk takes in a series of alpine tarns as well as a couple of rustic huts and provides exhilarating walking and great views. The walk commences at the Lake Dobson car park and if following it clockwise (recommended), initially follows a boardwalk and path by the side of Lake Dobson before branching off and climbing to a vehicular track that also climbs steeply to some ski huts. From here the walk proper begins along a well defined path and boardwalks, with great views of the Tarn Shelf and Lake Seal to the north. The track then drops down past a ski tow and shelter to pass by a series of tarns, eventually reaching Lake Newdegate and an old ski hut. From here, the path branches to the north-east to pass Twisted Tarn and ultimately to reach the secluded Twilight Tarn where an appealing old ski hut is worth a quick visit. The path then continues past Lake Webster, turning south to pass by Lake Seal and Platypus Tarn (visiting both of these requires taking a detour off the main path), before returning to the car park. This was a great walk and is highly recommended. The weather for me started a bit cold and grey, although this seemed to add to the atmosphere while walking along the Tarn Shelf. It eventually cleared up to a lovely sunny afternoon. Mt Field National Park has proved to be a little gem – close to Hobart, with plenty of variety and walks and yet not too busy – I was there on a Saturday in October and apart from a few people around Lake Dobson, did not see a soul along the walk. If you haven’t visited, it is well worth it.